The U.S. imprisons around 730 in every 100,000 people -- the highest incarcerated population in the world -- Department of Justice data shows. 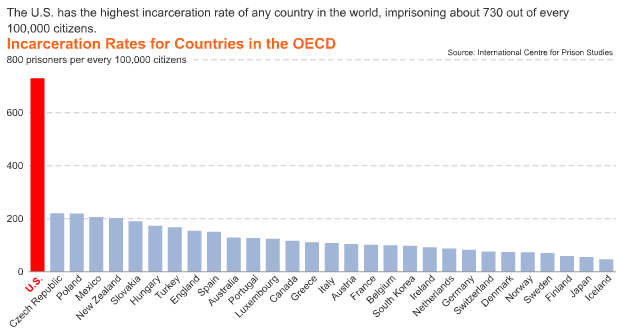 Once again, the U.S. has beat any other nation in terms of its number of prisoners and prisons. There are currently around 2.2 million people behind bars, "equal to a city the size of Houston," noted Bloomberg News. There are 4,575 prisons in operation in the U.S., more than four times the number of second-place Russia at 1,029. According to California Prison Focus, “no other society in human history has imprisoned so many of its own citizens.” Ample studies in recent years have detailed the swift rise nationwide in the for-profit prison industry.